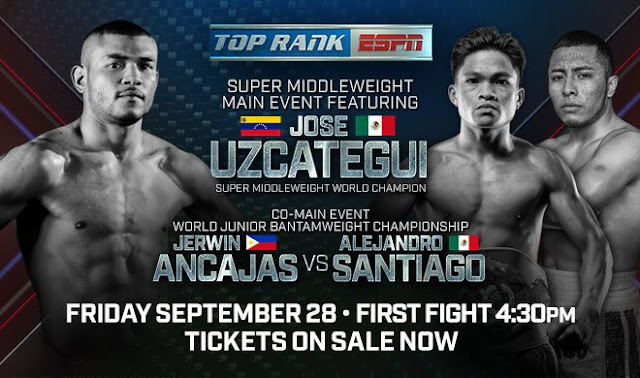 Watch the fight between the Filipino IBF World Super flyweight Champion Jerwin Ancajas and the Mexican challenger Alejandro Santiago Barrios on September 28, 2018 at the Oracle Arena, Oakland, California, USA. The Filipino champion coming to this fight handling a professional record consisting of 30 wins including 20 victories by way of KO's and has only 1 defeat, Ancajas successfully defended his title 5 times. On the otherhand, Alejandro Santiago Barrios is a 22 years old boxer with a record of 16W-2L-4D-7KO's. This would be the biggest fight of his career and he is coming off a split draw against the undefeated Puerto Rican Jose Martinez.